One of my favorite native plants, alumroot or coral bells (Heuchera spp), was once one of my biggest frustrations. Neither of the two widely sold species (H. americana and H. vilosa) nor any of the numerous named selections and hybrids performed well or persisted in my mostly clay soil. After seeing Heuchera growing wild in rocky, well-drained sites, I decided to try them in containers—there my former gardening frustration proved to be a workhorse plant I wouldn’t garden without. While most alumroot flowers are not particularly showy, ruffled evergreen leaves in various shades of green, sometimes marbled or streaked with burgundy or silver, provide interest year-round. Long cultivated in gardens, new hybrids are introduced each year in colors ranging from chartreuse to crimson. Alumroot works as “fillers” in mixed containers or as specimens alone in a pot. Compact varieties such as ‘Crown Jewel’ remain under six inches tall while ‘Autumn Bride,’ a hybrid with showy white flowers, can reach 24 inches in height. Alumroot plants need dividing every three or four years, a task made easier in containers. 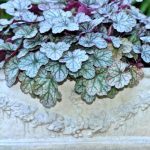 Their foliage may be tired and a bit tattered by the end of winter, but a hard cutting back and a watering with fish fertilizer are all that’s needed to promote new growth. During the growing season, I trim off dry or damaged leaves to keep the plants tidy. In our area, alumroot performs best in part sun to light shade. It also tolerates deeper shade, but in full sun the leaves may scorch. Heuchera was the first native species I grew in containers, but others have proven equally useful. Blanket flowers (Gaillardia spp) and sunset hyssop (Agastache rupestris) flower all summer in the hottest, driest spots without daily watering. Both are excellent for balcony gardeners or others limited to containers who want to provide nectar for pollinators and seed for songbirds. 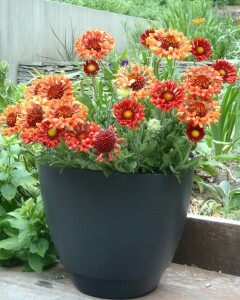 Sometimes reseeding, blanket flowers are annuals or short-lived perennials in the Triangle. Sunset hyssop is hardy enough to overwinter in containers and performs well when planted in the garden. 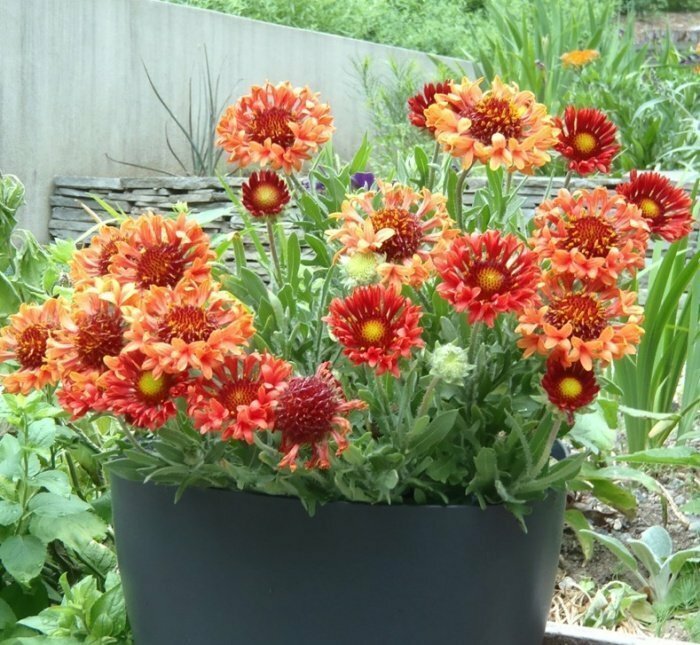 I’ve found using perennials in my containers is a thrifty way to generate more plants for my own garden and to share with friends. Needle palms are notoriously slow growing, so large specimens can be expensive and difficult to find. 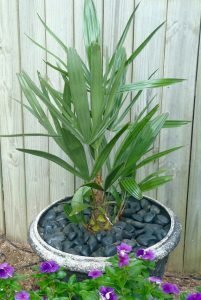 The small needle palm growing in a container on my patio should be large enough to have immediate impact when I plant it out in the garden in two or three years. In spite of its hardiness, I’ve given my needle palm added protection from cold by locating it near a south-facing wall and mulching it with river stone. 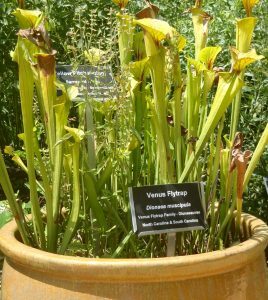 Next year I plan to add an even more exotic-looking native to my container collection—pitcher plants (Sarracenia spp). Mellichamp recommends a number of bog inhabitants that will thrive in a mixture of peat and sand in containers as small as 12 to 14 inches. My dry Piedmont garden is an unlikely site for a bog. But with the help of containers, my sunny deck might be the perfect spot.